Spiritual. Historically, all roads led to Santiago and the Camino de Santiago was walked as a spiritual pilgrimage. Kings, queens, and regular folk have, for many centuries walked the Caminos. When you arrive in Santiago, you can still opt to receive a Compestelo, recognition of your achievement, yes, but also a pardon in Latin from the Catholic Church for your sins. Even those not following a spiritual journey were emotionally moved by the experience. Exercise. No matter which of the routes you choose to walk, you’re going to get a great workout. Our average day included walking at least 25km (about 15 miles), carrying a backpack. Most of us ended up in better shape when we arrived in Santiago. History & Culture. Spending your days with your feet on Spanish soil, there’s no way not to feel the history and be immersed in the culture of the country. Roman roads and ruins, medieval castles, bridges, statues, fountains, and people still connected to the land through their own daily lives. Experience. Walking the Camino is an experience. Each day is about getting from point A to point B. But, there’s more to it. You’ll see the landscape in an intimate way. You’ll meet the locals. You’ll problem solve. You’ll make new friends. You’ll possibly alter your view of the world, too. It’s Safe. All things considered, it’s a very safe experience. It felt like the whole of Spain was watching out for me when I spent two months in their lovely country walking. Men, women, and families from around the world converge along the Camino. We became a family, watching out for each other. Plus, it’s the law. Pilgrims are not to be harmed or abused under penalty of Spanish law. Landscapes. Walking is simply a beautiful way to see Spain. You traverse the countryside; you travel through towns and cities of all sizes. Practically every moment is a photo opportunity whether it’s windmills on the hills, goats grazing around solar panels, storks nesting in high places, or narrow Roman streets. Amazing Food. Wow! The food is fresh and wonderful. Almost every restaurant and bar serves an affordable, 3-course Menu del Dia (menu of the day). Sample salads, soups, meats, fish, breads…I could go on and on. You can also prepare your own meals with local ingredients. And, because you’re getting so much exercise, you can eat all you want! Walkable. 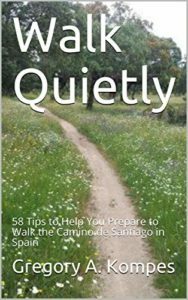 The Camino routes are relatively easy walks. There were some challenging moments, crossing a stream or walking up a steep hill. In general, just about anyone can walk this journey. Freedom. For nearly two months, I was living in the moment. The only goal was to get to the next town and, hopefully, enjoy the journey. Daily life changed. My perspective changed. Accomplishment. It is an amazing accomplishment to walk the Camino. 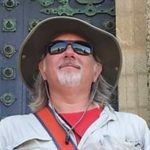 I journeyed the Via de La Plata from Seville to Santiago. It was 1000km (625 miles) and took almost seven weeks. I was exceedingly proud of myself and it’s another badge of experience no one can ever take away.